1. Grind all the marinade ingredients with some water to a chutney consistency. 2. Rub the marinade on the body and claws of the crabs. 3. Keep aside to marinate for 15 to 20 minutes. 4. Grind the legs of the crabs with some water to a fine paste. 5. Sieve the paste thoroughly using a muslin cloth and extract the juice. 6. Keep aside in a bowl. 7. Heat oil in a pan over medium heat. 8. Add the cinnamon and cloves. 9. When the spices start to splutter, add chopped onions and fry until golden brown. 10. Add black pepper and all the powdered spices. 11. Fry for a minute. 12. Add the desiccated coconut and fry for 2 minutes till coconut turns brown. 13. Add fresh coconut, crabs along with marinade and juice extracted from the legs. 14. Add 4 cups of water. 15. Cover and simmer for 20 minutes till the flesh of crabs turns opaque. 17. Add garam masala powder and cover for 2 minutes. 19. Serve with plain rice. 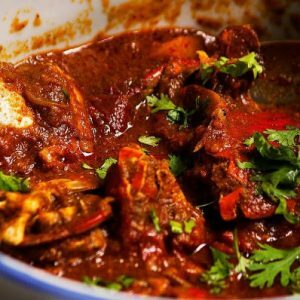 Feel free to comment or share your thoughts on this Crab Curry Recipe from Awesome Cuisine.